4 mei 2017: Ibrutinib geeft op 5-jaars meting 89 procent PR = gedeeltelijke remissies waarvan 29 procent CR = complete remissies. 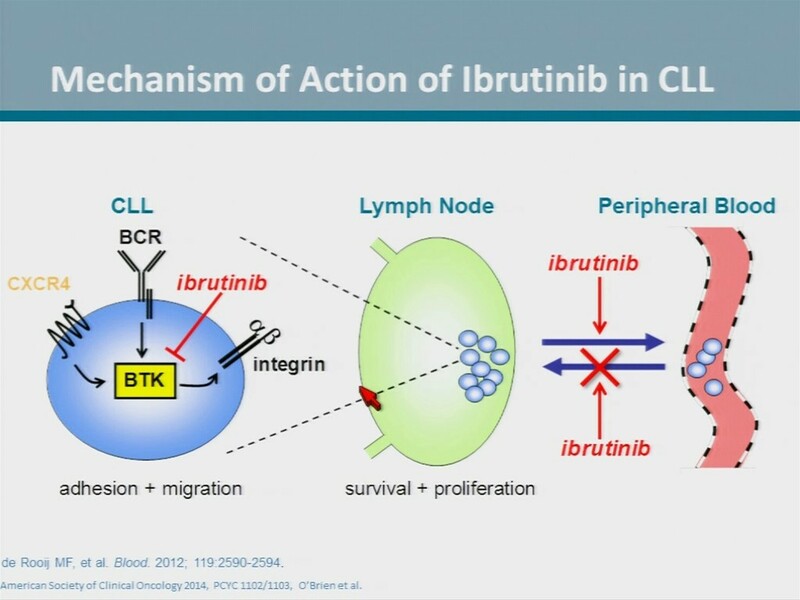 Lange termijn resultaten van ibrutinib (Imbruvica) bij patiënten met eerder onbehandelde of met chemo behandelde Chronische lymfatische leukemie (CLL) of (SLL) toont veel duurzame remissies. Op 5 jaars meting vertoonde 89 procent van de patiënten een remissie van minimaal 50 procent. 29 procent had een CR = complete remissie bereikt en waren op 5-jaars meting dus klinisch kankervrij. En belangrijk zonder ernstige bijwerkingen op langere termijn. aFour patients with untreated disease. 15 maart 2016: Bron: The Lancet, 2016 Feb;17(2):200-11. doi: 10.1016/S1470-2045(15)00465-9. Epub 2015 Dec 5. Hoewel de combinatiebehandeling bendamustine en rituximab al voor goede resultaten zorgt bij met name Chronische Lympfatische Leukemie en lymfklierkanker met kleine meetbare tumoren (>1,5 cm.) in vergelijking met bv. de CHOP kuren blijkt Ibrutinib als extra medicijn de progressievrije ziekte en overall overleving nog eens met tientallen procenten te verbeteren. De mediane progressievrije ziekte was in de ibrutinib groep nog niet bereikt versus 13.3 maanden in placebogroep (95% confidence interval = 11.3–13.9 maanden)(hazard ratio = 0.203, P < .0001). Dit blijkt uit een grote gerandomiseerde placebo gecontroleerde Fase III studie bij totaal 578 patiënten met CLL - Chronische Lymfatische Leukemie of recidief van meetbare lymfklierkanker ((>1,5 cm) verdeeld dus over twee groepen: ibrutinib N = 289) of placebo (N = 289) en gepubliceerd in The Lancet. Bovenstaande grafiek is uit: Independent evaluation of ibrutinib efficacy 3 years post-initiation of monotherapy in patients with chronic lymphocytic leukemia/small lymphocytic leukemia including deletion 17p disease. Conclusie: The addition of ibrutinib to bendamustine/rituximab increased progression-free survival in patients with chronic lymphocytic leukemia or small lymphocytic lymphoma relapsing after initial therapy. Improvements were consistent across high-risk subgroups. Het volledige studierapport: Ibrutinib combined with bendamustine and rituximab compared with placebo, bendamustine, and rituximab for previously treated chronic lymphocytic leukaemia or small lymphocytic lymphoma (HELIOS): a randomised, double-blind, phase 3 study. is tegen betaling in te zien. Lancet Oncol. 2016 Feb;17(2):200-11. doi: 10.1016/S1470-2045(15)00465-9. Epub 2015 Dec 5. Ibrutinib combined with bendamustine and rituximab compared with placebo, bendamustine, and rituximab for previously treated chronic lymphocytic leukaemia or small lymphocytic lymphoma (HELIOS): a randomised, double-blind, phase 3 study. Chanan-Khan A1, Cramer P2, Demirkan F3, Fraser G4, Silva RS5, Grosicki S6, Pristupa A7, Janssens A8, Mayer J9, Bartlett NL10, Dilhuydy MS11, Pylypenko H12, Loscertales J13, Avigdor A14, Rule S15, Villa D16, Samoilova O17, Panagiotidis P18, Goy A19, Mato A20, Pavlovsky MA21, Karlsson C22, Mahler M23, Salman M23, Sun S23, Phelps C23, Balasubramanian S24, Howes A25, Hallek M26; HELIOS investigators. 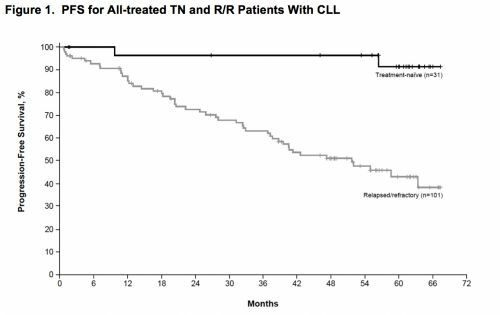 Most patients with chronic lymphocytic leukaemia or small lymphocytic lymphoma relapse after initial therapy. Bendamustine plus rituximab is often used in the relapsed or refractory setting. We assessed the efficacy and safety of adding ibrutinib, an oral covalent inhibitor of Bruton's tyrosine kinase (BTK), to bendamustine plus rituximab in patients with previously treated chronic lymphocytic leukaemia or small lymphocytic lymphoma. 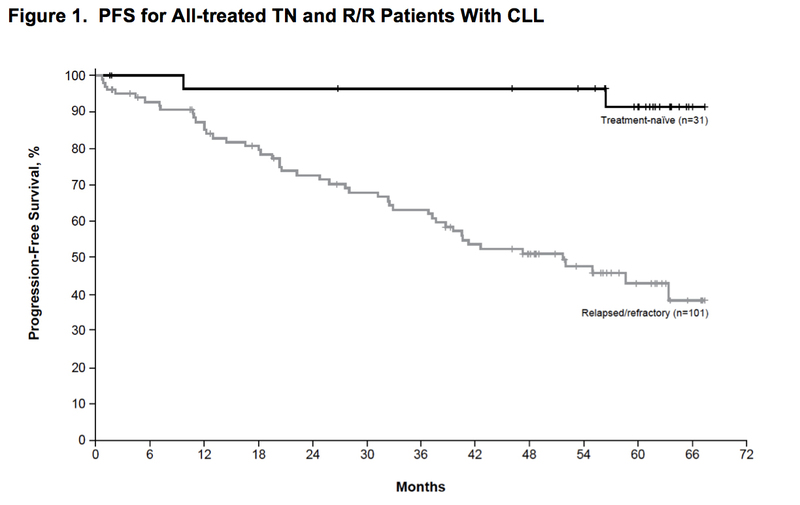 The HELIOS trial was an international, double-blind, placebo-controlled, phase 3 study in adult patients (≥18 years of age) who had active chronic lymphocytic leukaemia or small lymphocytic lymphoma with measurable lymph node disease (>1·5 cm) by CT scan, and had relapsed or refractory disease following one or more previous lines of systemic therapy consisting of at least two cycles of a chemotherapy-containing regimen, an Eastern Cooperative Oncology Group (ECOG) performance status of 0-1, and adequate bone marrow, liver, and kidney function. Patients with del(17p) were excluded because of known poor response to bendamustine plus rituximab. Patients who had received previous treatment with ibrutinib or other BTK inhibitors, refractory disease or relapse within 24 months with a previous bendamustine-containing regimen, or haemopoietic stem-cell transplant were also excluded. Patients were randomly assigned (1:1) by a web-based system to receive bendamustine plus rituximab given in cycles of 4 weeks' duration (bendamustine: 70 mg/m(2) intravenously on days 2-3 in cycle 1, and days 1-2 in cycles 2-6; rituximab: 375 mg/m(2) on day 1 of cycle 1, and 500 mg/m(2) on day 1 of cycles 2-6 for a maximum of six cycles) with either ibrutinib (420 mg daily orally) or placebo until disease progression or unacceptable toxicity. Patients were stratified according to whether they were refractory to purine analogues and by number of previous lines of therapy. The primary endpoint was independent review committee (IRC)-assessed progression-free survival. Crossover to ibrutinib was permitted for patients in the placebo group with IRC-confirmed disease progression. Analysis was by intention-to-treat and is continuing for further long-term follow-up. The trial is registered with ClinicalTrials.gov, number NCT01611090. Between Sept 19, 2012, and Jan 21, 2014, 578 eligible patients were randomly assigned to ibrutinib or placebo in combination with bendamustine plus rituximab (289 in each group). The primary endpoint was met at the preplanned interim analysis (March 10, 2015). At a median follow-up of 17 months (IQR 13·7-20·7), progression-free survival was significantly improved in the ibrutinib group compared with the placebo group (not reached in the ibrutinib group (95% CI not evaluable) vs 13·3 months (11·3-13·9) in the placebo group (hazard ratio 0·203, 95% CI 0·150-0·276; p<0·0001). IRC-assessed progression-free survival at 18 months was 79% (95% CI 73-83) in the ibrutinib group and 24% (18-31) in the placebo group (HR 0·203, 95% CI 0·150-0·276; p<0·0001). The most frequent all-grade adverse events were neutropenia and nausea. 222 (77%) of 287 patients in the ibrutinib group and 212 (74%) of 287 patients in the placebo group reported grade 3-4 events; the most common grade 3-4 adverse events in both groups were neutropenia (154 [54%] in the ibrutinib group vs 145 [51%] in the placebo group) and thrombocytopenia (43 [15%] in each group). A safety profile similar to that previously reported with ibrutinib and bendamustine plus rituximab individually was noted. Reageer op "Ibrutinib aanvullend op Bendamustine en Rituximab verbetert progressievrije ziekte en overall overleving met tientallen procenten bij Chronische Lymfatische Leukemia en recidief van lymfklierkanker met kleine tumoren copy 1"